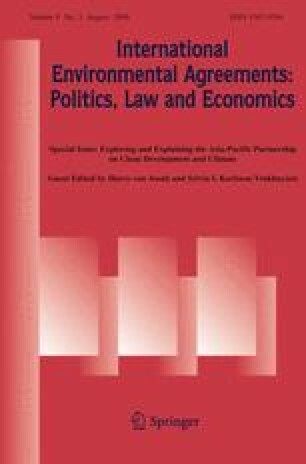 This introduction lays the groundwork for this Special Issue by providing an overview of the Asia-Pacific Partnership on Clean Development and Climate (APP), and by introducing three main analytical themes. The first theme concerns the emergence and continuation of the APP. The contributions show that the emergence of the APP can be attributed to international factors, including the United States’ rejection of the Kyoto Protocol, and its search for an alternative arena for global climate governance, and other countries’ wish to maintain good relations with the US; as well as domestic factors, such as the presence of bureaucratic actors in favour of the Partnership, alignment with domestic priorities, and the potential for reaping economic benefits through participation. The second theme examines the nature of the Partnership, concluding that it falls on the very soft side of the hard–soft law continuum and that while being branded as a public–private partnership, governments remain in charge. Under the third theme, the influence which the APP exerts on the post-2012 United Nations (UN) climate change negotiations is scrutinised. The contributions show that at the very least, the APP is exerting some cognitive influence on the UN discussions through its promotion of a sectoral approach. The introduction concludes with outlining areas for future research. We would like to thank Steinar Andresen, Frank Biermann, Harriet Bulkeley, Peter Lawrence, Jeff McGee and Antto Vihma for their comments on an earlier draft. The research was in part conducted under the project Adaptation and Mitigation Strategies: Supporting European Climate Policy (ADAM), financed by DG Research of the European Commission under the Sixth Framework Programme 2002–2006, Priority 1.1.6.3, Global Change and Ecosystems. Harro van Asselt would furthermore like to thank the Canon Foundation Europe for the financial support for the research stay at the Tokyo Institute of Technology. APP Charter (2006). Charter for the Asia-Pacific Partnership on Clean Development and Climate. Retrieved May 20, 2009 from http://www.asiapacificpartnership.org. APP Vision Statement (2006). Vision statement of Australia, China, India, Japan, the Republic of Korea, and the United States of America for a New Asia-Pacific Partnership on Clean Development and Climate. Retrieved May 20, 2009, from http://www.asiapacificpartnership.org. Canada. (2008). Country statement—Canada. Retrieved May 17, 2009, from http://www.asiapacificpartnership.org/pdf/vancouver/CountryStatement_Canada.pdf.